This competitive 16-month online degree program is offered to experienced professionals who currently work in government and nonprofit agencies. The rigorous format has been designed for working professionals who are currently employed in managerial positions in public administration, nonprofit administration, urban planning, criminal justice or related fields. Past experience in these fields will be considered for applicants who are not currently working in the public or nonprofit sector. The 36-unit curriculum is the same as the campus-based program; however, the fast-track, online program is taught in six, two-month modules with two on-campus experiences — one at the beginning and one at the end of the program. San Diego State University's Master of Public Administration Program (MPA) is ranked the #1 program in the CSU and ranked 5th in California by US News and World Report (2012). Applications will be accepted Aug. 1, 2019–Nov. 1, 2019 for the next cohort that is scheduled to begin in January 2020. Please sign up for the mailing list if you'd like to be notified of application deadlines. In each two-month module, students take two accelerated courses as part of an online peer cohort. Students receive a brief break (generally two weeks) between modules. The final module consists of a capstone research course where students develop an applied research project. The capstone research project is presented to a panel of professional practitioners and faculty during the final on-campus experience. The MPA provides the knowledge and skill sets for students in management careers in government, community agencies, private not-for-profit organizations, planning and consulting firms and private sector companies that work in partnership with the public sector. The courses, as well as the faculty who teach the online courses, are the same as the campus-based program. Students must take seven required courses that include: Public administration theory, research methods (2), administrative theory, public personnel administration, public finance management and public policy. Students take four electives that are tailored to the interests of each cohort. Examples of electives that may be offered include urban government administration, employer/employee relations, nonprofit relations and government, administrative behavior and comparative public administration. Students finish the program by completing a capstone course addressing a challenge at their place of employment. 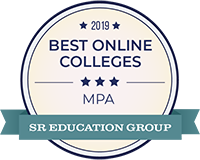 Applicants holding a bachelor's degree in any major from a regionally accredited university are eligible to apply for admission to the online MPA program. The applicant's competitiveness will be largely based upon professional and past academic accomplishments in the field of public administration. Applications will be accepted Aug. 1, 2019–Nov. 1, 2019 for the next cohort that is scheduled to begin in January 2020. Admission to the MPA program is based on the SDSU Application. Submit your application for the Public Administration (MPA) External Degree. The following is needed to complete your application: Official transcripts, GRE test scores, two letters of recommendation, resume, internship waiver and statement of purpose. For an overview of the admissions process, please refer to this Road Map. Overall grade point average. A minimum grade point average of 3.0 in undergraduate work is considered desirable, but a 2.85 GPA (on a 4-point scale) may be acceptable for admission. GRE Score. Applicants are required to take the verbal, quantitative and analytical sections of the Graduate Record Exam (GRE). An overall target score in the 35th percentile or better on each of the sections of the exam is considered minimum. The minimum may be waived in certain circumstances. The GRE exam is waived only for applicants who already hold an advanced degree (i.e. MBA, MS, MA, JD, etc.) from an institution that is a member of the Council of Graduate Schools. Applicants can sign-up for the GRE test through the Educational Testing Service (ETS). Two Letters of Recommendation. Letters should come from a person familiar with the applicant's professional accomplishments and/or academic ability and accomplishments. Internship Waiver Request Form. The internship waiver request form ensures that full-time professionals will be excused from the internship requirement. This form will be accompanied by a letter from a current or past supervisor(s), on organization letterhead, describing the applicant's professional experience. This letter is required in addition to any letters of recommendation submitted on behalf of the applicant. Resume. A professional resume describing the applicant's work history is required. Describe your professional goals and how you believe the MPA degree will contribute to these goals. The online MPA program is highly intensive; students complete the entire degree in 16 months whereas on-campus students who work full time normally might complete the degree in three years or more. Describe the strategies you will use to balance competing demands on your time (school, work, family) and be successful in the program. Include any additional information you believe is important for the admissions committee to consider when reviewing your application. *The SDSU Application will also have a section for a statement of purpose. Please type “submitted to department” on that form. Your application will not be considered complete until your application and all supporting documentation is submitted. In addition to the above application process, International applicants are required to take the TOEFL (target score of 80) or the IELTS (score of 6.5). What distinguishes this program from other online MPA programs? San Diego State University is an exceptional applied research university and the only university among the California State University's 23 campuses to be designated as a Carnegie Research Intensive University. The university's quality and distinction have been demonstrated in numerous ranking systems. SDSU has offered an MPA program for nearly 50 years. Thousands of alumni from the MPA program serve in leadership positions throughout the United States. The program is accredited by NASPAA, which is the national standard for the profession. This accreditation ensures instruction is on the cutting edge of the field and meets nationally established education standards. SDSU's MPA program is ranked #1 in all the CSU schools and #5 in California. In addition to having access to respected scholars and accomplished practitioners in their fields, students receive individualized academic and professional development support during their journey in the MPA program. The tuition will be approximately $509 per unit (subject to change). This is highly competitive with online MPA programs throughout the nation. Each class is three units. In addition to tuition, students are responsible for course materials such as textbooks and software to support coursework. Travel and accommodations for the two on-campus experiences at SDSU are also the responsibility of the student. What type of academic work does a student complete in an online course? All course activities are asynchronous, meaning students do not have to be online at any particular day or time to participate. There are weekly assignments which could include discussion board responses, group exercises and papers based on reading assignments. Classes also require the completion of research projects and most classes require completion of exams. The internship requirement is waived for most full-time public or non-profit sector professionals. In rare cases when an applicant has been accepted into the program without a minimum of two years of professional experience, enrollment in an internship course would be required. May I start the program early through Open University? Enrollment through Open University is not permitted. All students must go through the application process stated above. May I take just one or two courses to supplement MPA work I'm completing at another university? Unfortunately, we cannot accommodate students attending other universities into our online MPA program. The program is designed to be self-contained so only students who have been vetted through our application process, and who have demonstrated a commitment to complete the entire program will be accepted. I have taken graduate-level courses in the past. Will these units transfer? No units can be transferred into the online MPA program. The program is designed to be self-contained and to build a learning community among all the students. As such, it is important that all students take the same courses at the same time. If I find two classes per module too much given my full-time job, can I take one course during some modules? This is discouraged since the program is designed as a cohort model. However, we anticipate starting a new cohort approximately once each year, so there will be options in the future to make up coursework. Will my diploma designate that I received my degree online? The diploma that online MPA graduates receive is the same diploma received by students who completed the MPA program on campus. The modality of the program is not listed on the diploma. Will I be able to participate in on campus graduation ceremonies? All MPA students, including those enrolled in the online MPA program, are invited to participate in the School of Public Affairs' annual awards ceremony and SDSU's graduation ceremony in May following completing of the program. Are there career advising services for students? The School of Public Affairs offers comprehensive, personalized career advising and professional development services for all MPA students. Whom may I contact with additional questions about the online MPA program? Prospective students may contact MPA Advisor, Robert J. Sobie, Ph.D., at rsobie@sdsu.edu or (517) 667-1023. Only students admitted to the MPA cohort may enroll in these courses. Eligible students will receive course registration links via email. The development of public administration as an academic discipline; a systematic evaluation of the rise and operations of large-scale public bureaucracies. Research design for problems and cases in public affairs; summarizing and organizing data; methods of projection; sampling theory and application; using census and other secondary data sources. Advanced techniques for analyzing problems in public and urban affairs; emphasis on computer applications. Selected problems in the management of urban governments. Maximum credit six units applicable to a master’s degree. Organization development theory and practice. Emphasis on organizational diagnosis, intervention theory, team building and process consultation skills as they apply to public sector organizations. Organization and management; the executive role, decision making; bureaucracy; authority and power; communication and control and organizational system; tactics and strategies in effective management. Economics and politics of the public sector. Theories of public expenditure analysis and revenue generation. Issues of ethics and efficiency in government financial policy. Social, political and administrative problems involved in govern- mental program development and change. Analytical treatment of selected problems in Public Administration. Review of methods for investigation and reporting of data. Consideration of problems in preparation of projects or thesis. Follow the SDSU School of Public Affairs on Facebook.